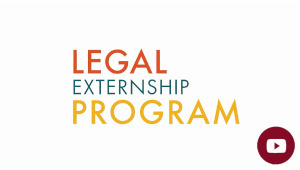 The Legal Externship Program aims to provide opportunities for students to work directly with practicing attorneys and professionals while engaging in critical reflection about the legal profession, their legal career, and their priorities and values as lawyers and individuals through supervised field experiences and externship seminars. Developing the art of lawyering, including such skills as research, writing, legal analysis, client interviewing, communication, negotiation, and advocacy. Providing opportunities that integrate substantive learning with the practice of law. Promoting the ethical practice of law by sensitizing students to issues of professional responsibility. Assisting students to develop confidence in practical lawyering situations. Increasing students’ understanding of their own individual strengths and weaknesses as lawyers. Exploring and understanding workplace issues such as time management, workplace culture, teamwork, giving and receiving feedback, and achieving balance in one’s life. Promoting self-directed and lifelong learning.